The philosophy of sustainable design (also called environnemental design , eco- conscious development, etc…) consists in developing artifacts, building materials, creature comforts in line with the principles of sustainable development and responsible economic activity. The sensitive approach of sustainable design consists in getting rid of the negative impact of artifacts and buildings on the environment. Sustainable design uses renewable components only. Thus, the impact on the environment is minimal and people live closer to their natural environment. This philosophy applies as much to the many items of our everyday life as to macro-structures (buildings, cities, territories).its perimeter encompasses the branches of architecture : landscape architecture, urban architecture, basic city organizing concepts, engineering, graphic design , industrial design, interior decoration, and fashion. As a response to environmental crises, such as demographic explosions, waste of natural resources, degradation of the ecosystem, and biodiversity on the wane, sustainable design has been on the rise. The burning fossil fuels and other energy consuming processes in the industrial world let off carbon dioxide and other pollutants in the atmosphere. These emissions trigger the global warming phenomenon presently affecting the Earth’ climate. Our health cannot but be affected by it , of course. It thus follows that improving the populations’ well being, while avoiding the destruction of our environment demands another mode of resource management. Technology is the key to this new mode of resource management. Throughout the world, businesses and research departments are working on answers to the challenge of producing clean energy, coming up with clean means of transportation, made of non polluting, recyclable, reliable and shock-absorbant materials. The making of the future‘s means of transportations should also optimize the use of natural resources as much as possible. Actually introducing these changes in our ways of life would greatly help protecting the ecosystems, so that a healthy biodiversity would be passed on the future generations. Our goal is to set a way of development that would both meet the needs of the present and the next generations. In order to achieve this goal, we must first take into account the necessary care of the basic needs of the most destitute, and then consider the fact that there is an inherent limited range in our actions, due to the present state of our technical knowledge and the way human organizations tax their environment, thus limiting the ability of their environment to meet the need of the current and future generations. Yet, some of these novelties increase our carbon footprint, intensifying global warming. 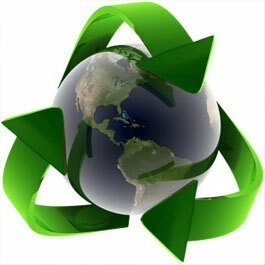 Sustainable development means enhanced respect and consideration of the environmental factors by Research and Industry. Sustainable medicine means using green healthy substances as a cure, avoiding components harmful to biodiversity. 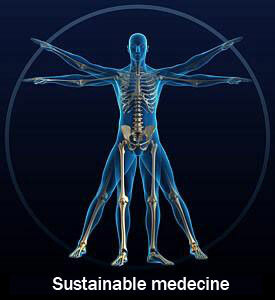 Sustainable medicine is based on ethics. Therefore, it opposes experiments on animals – except in case of real emergency, and in the absence of any other possible way out of the problem. All drugs are thus made out of natural components. The OMS statistics show that 80% of the world population use traditional medicine for their every day cures. The situation is still so, two decades after the Northern hemisphere rediscovered the virtues of Natural Healing. Meanwhile, more a than a third of the inhabitants of developing countries still have to do without the most elemental drugs. Giving these populations access to traditional/alternative therapies – proved as reliable and efficient –could be the pivotal element on which growing health care services would hinge. Allowing better treatments to developing country populations.